From time to time, I go back and read some of the most memorable and influential books I read while growing up — this set of 5 books: Nine Princes in Amber, The Guns of Avalon, Sign of the Unicorn, The Hand of Oberon, and The Courts of Chaos — were hugely important to me. They told about an interesting, edgier type of universe than The Lord of the Rings, and I was pretty captivated by them. I’d been wanting to read them again, but they’re not available in Kindle editions, so I’d been sort of dragging my feet. But I happened to be near a used bookstore the other day and found a volume with all 5 books in it — and devoured it over the course of about 10 days. Really fun to read, really fun to remember. And there were a couple of twists that I remembered being totally shocked by when I read them as a teenager — they obviously weren’t as surprising to me this time around, but I really enjoyed remembering the feeling. Anyway, not all books hold up 25 years later, but for me, these did for sure. This entry was posted on Saturday, September 18th, 2010 at 10:56 am	and is filed under Books. You can follow any comments to this entry through the RSS 2.0 feed. Both comments and pings are currently closed. I recommend a re-read of Lord of Light (http://www.amazon.com/Lord-Light-Roger-Zelazny/dp/0060567236/), which is still easily my favorite by him. I’m not sure what’s up with older authors and the lack of ebook versions of backstock. I was looking for Pohl’s “Gateway” the other day after recommending it to my wife and it isn’t available either. Aw man, I loved the Chronicles when I was a kid. I have them now in the “whole series in one entirely unwieldy volume” format, but it’s a beast. Another very influential series for me was Ursula LeGuin’s Earthsea Trilogy, of which I still own my original second-hand paperbacks 🙂 And the Belgariad, of course, but I suspect I’m not alone in that one. I managed to get a complete (mostly secondhand) edition of all of the E.R. Burroughs “John Carter of Mars” books recently that fulfills the same childhood role for me. 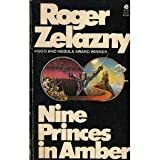 The amber books were pretty awesome for a young teenager. You’re totally right. It was a bit more edgy than most of the other fantasy and sci-fi I was reading at the time.